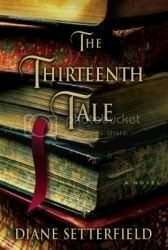 The Thirteenth Tale is one of those rare books that come along, grabs you from the first page, won't let go until the very end, and then leaves you wanting more. Harkening back to Gothic novels such as Jane Eyre, The Thirteenth Tale weaves an intricate spell in its telling, leaving you feeling slightly dazed at the conclusion. When Margaret Lea receives a mysterious note one day from England's premier storyteller, Vida Winter, little does she know that what commences will be a story unlike any she has ever heard. Vida Winter is the consummate storyteller of her day, providing no less than 19 versions of her life's story. Margaret Lea is a biographer who deals in only facts. When Vida Winter finally decides to tell the truth to Margaret, naturally she can only be suspicious. Margaret asks for 3 verifiable details from Miss Winter's life, and when Miss Winter offers those up, she knows that she will be given the truth. The truth is a story so compelling and well-written that she becomes lost in its telling and the fabric of Miss Winter's life. For the reader, Diane Setterfield has created an amazingly haunting ghost story. There are so many twists and turns that I didn't even realize were occurring that when I discovered them, I would backtrack just to see how cleverly she placed them in the story. Compared to some of the greatest works of Gothic romance and mystery, you'll find a little bit of everything here: secrets, mysteries, murder, madness, obsession, ghosts. Setterfield brings all the elements familiar to the genre together into her own masterfully written tale, creating a book that is both spellbinding and unforgettable. This is one of those books that I would place at the top of my all time favorites and can read and reread over again. If you are looking for a great paced, well-written Gothic adventure, then this book is for you!